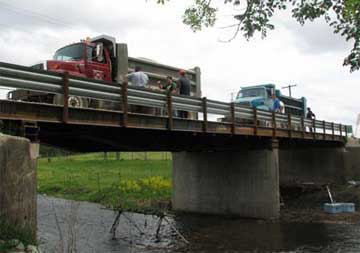 Based on the conclusions of IHRB Project TR-444, Demonstration Project Using Railroad Flat Car Bridges for Low Volume Road Bridges, additional research on the use of RRFC bridges was undertaken. This portion of the project investigated the following: –Different design and rating procedures –Additional single span configurations plus multiple span configurations –Different mechanisms for connecting adjacent RRFCs and the resulting lateral load distribution factors –Sheet pile abutments –Behavior RRFCs that had been strengthened so that they could be used on existing abutments. 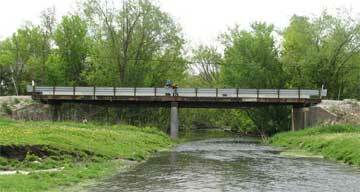 A total of eight RRFC bridges were tested (five single span bridges, two two-span bridges, and one three-span bridge). Based on the results of this study a simplified design and rating procedure has been developed for the economical replacement bridge alternative. In Volume 1, this volume, the results from the testing of four single span RRFC bridges are presented, while in Volume 2 the results from the testing of the strengthened single span bridge plus the three multiple span bridges are presented.